my mode of contacting you will in any way offend you. will understand when we discuss details of my proposition. invest and do business with you as my partner in in your country. business as i have just little idea about business. before he died as result of the civil war in my country. enable me discuss details and proceedings. 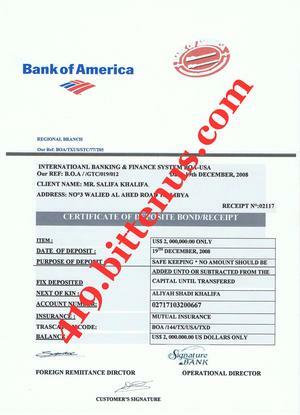 The money is my inherited fund which was deposited with bank of america before he died, I will give you more details If you are sincere to help me transfer the fund into your account then you can send me little part of it , to get my ticket and visa to come and meet with you for the purpose of the investment. my dear i can not do anything or transfer this fund because of my orphanage status here in Senegal west Africa were I escape during the civil war in my country Libya,and i am also very young to handle international transfer. Am devoted Muslim girl which I believe it will not affect our investment schedule,I want you to understand that I have no experience concerning Investment, that is why I seek your full assistant to invest in your country however as a citizen, I would prefer that everything concerning the investment should be registered on your name & my name to enable things done perfectly. Kindly send me your below details for more trust and confidence between us meanwhile i shall also introduce you to the bank with your details as my foreign investment partner to receive the fund. 1, what is your suggested investment for me? 2, how much interest are we expecting for a year? I solely depend on your ability however I will forward the bank website and contact details including all the necessary legal documents of the fund to you, however kindly provide me your above details so that we can proceed further. Meanwhile contact the bank with the below bank details and tell the bank that you are my foreign relative to receive the fund for investment purpose. I will stop here and my greetings to your family, waiting on that faithful day that I will meet you.